You don’t think the pickpocket pro will target you but all it takes is you to turn your focus for one second and your wallet will be missing. Learning how to pickpocket doesn’t require a degree rather it’s simply practice and you don’t want to be the one they practice on. I don’t know if any of you, especially the ladies have had your wallet stolen from your purse before but you can feel so violated knowing you were right there. I could have probably taken my camera and went around a few grocery stores this week and snapped pictures of lonely shopping carts with open purses sitting in them. It happens all the time and for some reason I notice these things and maybe because my instincts kick in wondering how someone could leave their purse alone for someone to steal boggles my mind. I make sure my wallet is always in my back pocket even though many men will tell you keeping your wallet in your front pocket is likely a better place to deter any pickpocket. Yes a pickpocket will put their sticky fingers in your back pocket to steal your wallet or even in an open purse you keep around your shoulder. These pickpocket thieves are pros and believe it or not some of them even do searches online to learn how to be a pickpocket pro so they can go out and make some easy cash. You might even find these people trying to pull off a parking lot scam at the grocery store as well like we experienced first-hand earlier this year. If you don’t carry cash and don’t think it’s a big deal having to worry about all of your credit cards and bank cards going missing could be an even bigger deal and hassle. You know all you have to do these days is tap a credit card to pay for a purchase so I’d be just as worried with or without cash in my wallet. If you are someone who uses the budget envelope system you might just bring cash with you to the grocery store in an envelope which might be safer as long as you keep it in your front pocket and not in your purse. If you are a guy the same thing goes alternatively keep your cash in an inner pocket of your jacket that is zipped up. Who does a pickpocket target? They target anyone and everyone. They will likely watch for those women who have a purse in a shopping cart open and have kids distracting them or if they see you wandering off and leaving your cart. They might also target a senior which happened just recently in a neighbouring community which inspired me to write this post. 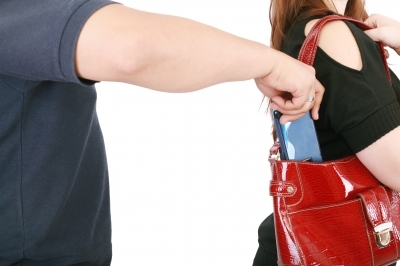 A pickpocket will go to a grocery store first because it’s one of the easiest places to steal a purse or wallet because we make it easy for them. One suggestion to protect your purse is to zipper it up so no one can see inside. The next valuable thing besides your wallet is likely your smartphone so don’t leave that in clear view either. One suggestion I heard was if you have a shopping cart with baby straps you can lock your purse in with the straps which makes it difficult for the pickpocket to steal your entire purse. If you carry your purse make sure it’s closed and keep the zipper opening facing you rather than behind your arm. The pickpocket can easily slide the zipper while standing behind you if you leave it facing them and they can swipe your valuables without you feeling it. Think again if you think you will feel the pickpocket violating your belongings because these men and women are professionals and know what they are doing. They might even simply bang into you to cause a bit of a scuffle that looks like an accident. They know they have time to get out of the store as well because most people don’t know they are missing something until they cash out only to find their wallet missing from their purse or back pocket. Has your wallet ever been stolen at the grocery store or any shopping centre? What other tips can you share for those who carry a purse or wallet into the grocery store? GGC Posters: Please note that in the event my wife goes into the hospital I may not be able to get my GGC posts up. That doesn’t mean I want you to stop posting because when we stop doing something we get out of routine and it’s hard to get back into it. August will be a 5 week month for us! 5 Litre Juice jug $0.97 reg $5.00 comes with cups too! 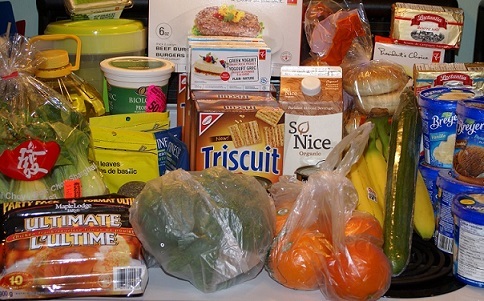 Weekly Overview: Lots of what we bought was to stock up for the hospital like juice and crackers. The cream cheese was a super deal and we couldn’t pass that up. We did find lots of blowout and pink sticker deals this week which worked out great. We are limiting what we buy just so we don’t have food wasting if we aren’t here. We just happened to get lucky with the free ice-cream too because we had a few coupons from Unilever from earlier in the summer for $1.00 off any Breyers etc. The hotdogs and burgers will be for our quickie meals as we have a feeling we will be needing them soon. I finally bought some corn at Metro and although it wasn’t from the local farm it still is a great deal. I just haven’t had time to drive to the farm this year. I also stocked up on freezies for next summer and the kiddos who come over here to visit. $2.49×10-$1Cx10 assorted cream cheese – nov expiry! I did get items that are not necessary in the budget but I knew we were under so didn’t mind getting these things. Well this will be another week of not needing much. I tend to wear a purse that is close to my body so that its not sitting out. I would go crazy if someone stole my purse 🙁 I have seen quite often when people just leave their purses sitting out and its just shocking to me. Here goes! This will finish off the month for me and it looks like I did it! I did go to Canadian Tire as they had the Method liquid hand soap I like on sale so I grabbed two of them. One for the upstairs bathroom and one for downstairs. The news for the ends the month is that I made it!! It was not easy and there were some super deals to take advantage of but I did it!! I managed to get a couple of little things for the local food bank! It’s not the greatest food-wise but the chez whiz and the PB are the kind of things they are always looking for, especially now with back to school.. Given the start I had to the month and going over the last couple of months this is quite good. I didn’t get rid of the carry over but I did put a good size dent in it. All in all I am very happy with how the month ended up for me…. Weekly overview: Well I did it! I am finally under budget for the month. Unfortunately it feels like a failure because I had to use $140 worth of PC points to do it. All I can do is keep on trying. This was my last week of shopping before going back to work/school so I am hoping that getting back into routine will help the budget. I am also happy to report that I have caught up on my budget! Yes, this year, I have broken out what is being spent on eating out, what is spent on the cats and then what is spent on my daughter and myself. Once some of my other bills are in a better situation, then I can create a stock pile budget for those extra great deals. I know what you mean by the price of beef but so far, I have made some meatballs and ground beef for spaghetti. The rest is in the freezer for future meals. As far as the eggs, I figure that I can always make some egg salad or use it in a potato/macaroni salad. If not for that, maybe some baking will be done and put in the freezer for future treats. I’m excited for the all the changes that’s going on. Since working full time, close 20 years ago, has cooking even been this interesting or caught my attention as much as it has now. I’m hoping to keep this going and maybe this will also help get my financial even better that much sooner. Good for you Della! Cooking is fun, relaxing and MUCH CHEAPER than eating out as we have all learned at CBB. What I love about WFD is all of the recipes we share and I learn new ideas. It is true what they say about taking on the same qualities of those you hang around whether it be saving or trying new recipes at home. I agree with the eggs. There is so much you can use eggs for. My wife is one of the victims sadly by pickpocketing. That happened in the grocery. She was not aware that her purse was missing already. The sad part is that most of her IDs and cards were in the wallet. It was hard getting all those getting new IDs again. 🙁 So, whenever she go to grocery, she only bring the money which she just hold or place deep inside her bag. Once it happens once you don’t make the mistake twice. It’s hard when you feel violated like that. Thanks for sharing Jayson. “Weekly Overview: This week I used up the balance from last week’s shopping and this week’s plus next weeks. Many of these deals, I just pass up on and now I have a bit of a stock pile of some items, which will be good to have on hand. This type of shopping trip happens about once every couple of months so I should be good and stay under the weekly budget going forward (until the next time :)). I know that I have to set some $ aside to account for this type of shopping and it will eventually happen but at the moment, I have bigger “”fish to fry”” and this will be put on the back burner for now. I tend to walk with my purse tucked under my arm with the zipper at the front. At the grocery store I toss it in the main section of the cart and bury it under the groceries by the end of the first or second aisle!! Living in a small town I see women leave the purse open in the child’s seat all the time, or they leave the purse in the car and leave their car unlocked…. it drives the cops nuts!!! The local police have been known to do a door check in the parking lots, if your door is unlocked they leave a nice little note on your front seat. Pick pockets are not a big deal here but we have cars gotten into all the time…….either stuff is stolen from the vehicle or the vehicle itself is taken for a joy ride. I lock the truck always… we have had our vehicle gotten into in our driveway so we know it happens. Nothing important taken, a little change and a container of bits and pieces of paper that had directions to where ever in it. You know..you go to visit someone and you get the direction there written out on a piece of paper so you leave it in the car for next time…..So nothing serious taken. But we locked the vehicle in the driveway all the time!!!! I’ve never been pick pocketed, but like you, I see women leave their purses unattended all the time.I guess because we live in a small town, they feel safe? My husband carries his wallet in his front pocket. When I carry my purse, instead on swinging behind me, I keep it in front..especially when people are around, and walking thru crowds. I am still away on vacation but hubby continues to email me the details of what he has spent on groceries. Since this is the last shop for the month, we will transfer the $2.80 over to our US shopping funds for Sept 1st. TOTAL UNUSED RESERVES $740.00 … that is a $400.00 carry-forward from 2013 and $340.00 in NEW 2014 savings. So, if you look at the $2,171.18 calculation that we have spent in 2014 and subtract the $340.00 we have actually saved in our “reserves” and the $277.80 ($183.80+94.00) we have recorded as spent but is actually set aside for future USA grocery shopping… we have actually spent $1,553.38!! That is $33.38 over the $1,520.00 we budgeted for January through August. 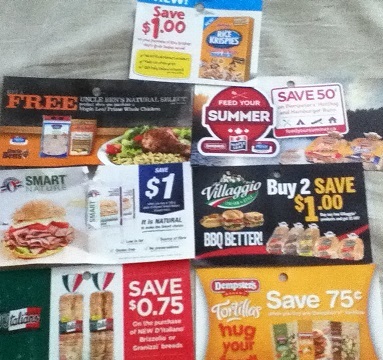 BUT if you also take out the cash that was either a gift, some non-budgeted earning method or a loan repayment: ($96.91 Hiding Spot Cash from bottles etc + FREE $20 Safeway Gift Card + $80.00 Cash Repayment from a neighbor + $24.27 from a 2013 Costco Rebate Cheque + $0.00 used out of a 2014 Costco Rebate Cheque for $13.45 + a Christmas present of a $250.00 Safeway Gift Card) = $471.18 then we actually only used $1,082.20 of the budgeted $1,520.00 have a Budgeted Grocery Balance SURPLUS of $437.80 still sitting in our bank account. IF you don’t pay any attention to how we paid for the groceries, then the seemingly $33.38 overage will easily be absorbed into the value of an additional 5 weeks x $47.50 = $237.50 vacation we will be taking later on in 2014 and still leave us an additional $204.10 to add to our cross border shopping budget.